The sisters have been recording with familiar and new faces as they aim for a fall release. 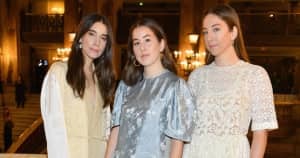 Haim's certainly been busy with a rigorous touring schedule since the release of their 2013 debut Days Are Gone. Now it seems the band is getting closer to finally finishing up their sophomore effort, according to Rolling Stone. The trio reveal they wrote the record in their parents's living room and then decamped to Days Are Gone producer Ariel Rechtshaid's LA recording studio to lay down the tracks. Rostam Batmanglij, formerly of Vampire Weekend, also recorded with the band. Este Haim said they aren't out to "reinvent the wheel" with this album. "It's been more about coming together and asking each other how we were feeling and what we were feeling and how we wanted to express that," she said. Danielle Haim spoke on the new tunes saying they are going for a more organic sound this time around because of their live show. "...this time we came at it from a more organic, rock standpoint. Because when we play live, we realize that ultimately, we're a rock band."